The aliens have landed. Well, hovered is more like it. 20 years ago in Johannesburg, South Africa, aliens arrive in a ship and do little more than hover over the city. However, fear of the unknown spurs the humans to cut into the hovercraft where they find that these foreign beings are malnourished and living in trash. Feeling pressure to do the right thing for them, Johannesburg sets up a living space known as District 9. 20 years later, District 9 is nothing more than a ghetto slum housing 1.8 of these “prawns.” They cannot be contained though, which prompts a massive private company to go forward with a plan to move the aliens to concentration camp-like District 10, led by a snide field operative Wikus van der Merwe (Sharlto Copley). During this forced removal, Wikus comes in contact with a strange black substance that immediately begins to transform him into one of them. Valued as nothing more than a science experiment, Wikus now is a branded fugitive in his own land. It definitely isn’t required, but good science fictions often seem to reflect or touch upon society—past, present, and/or future—in some way. 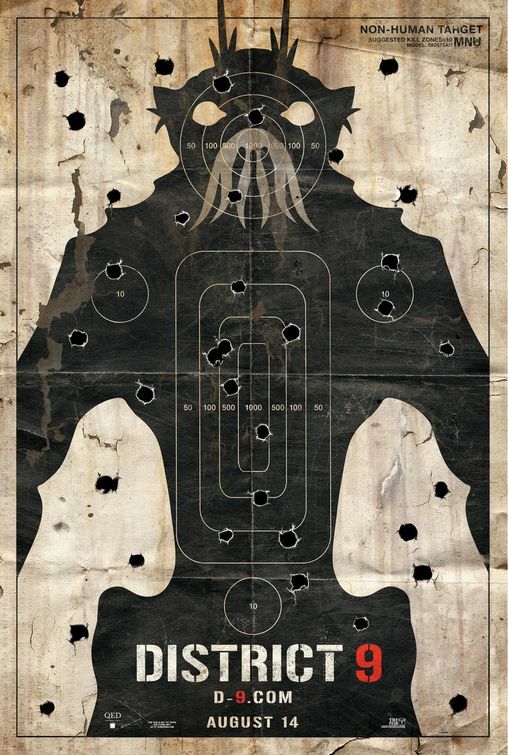 Neill Blomkamp’s District 9 makes its intended focus evident. For decades, South Africa was known for Apartheid, racial segregation somewhat akin to what the United States experienced. Maybe to some it can be argued that it is really heavy handed, but it is clear within the first 10 minutes what the film’s message is. And it makes District 9 no less captivating. The documentary-style approach, sometimes rightly attributed to cheap filmmaking, is an asset here. Utilized early on and through a solid chunk of the film, it really places the viewer into an alternate universe that truly feels like the real thing. That is to say, that even with the inclusion of aliens, yours truly never found this world odd or hard to buy into. This literally feels like it happened and is a part of actual history. Of course, it doesn’t hurt that the movie looks impressive. Whether it be a prolonged horrific transformation sequence (still chilling), or the simple way the aliens look and exist here, the attention to detail is impressive and is on par with many, more expensive blockbusters. 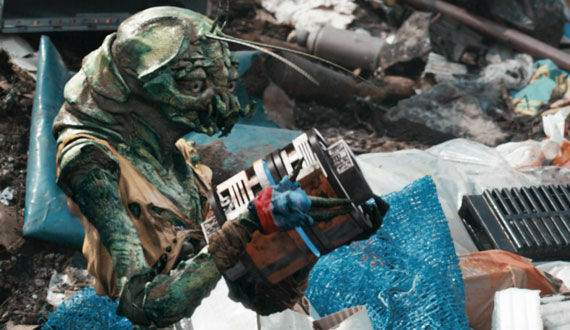 District 9 goes down as one of the better movies that integrates visual effects and digitally created entities into a realistic world at an extremely high level. Blomkamp makes quite the debut as a full-length director with this one. Not only does he craft an wonderful allegory touching upon xenophobia, segregation, private corporations, and more, he allows it to play out and build with efficient pacing. Nothing ever comes off as rushed or stilted. With that said, there is a noticeable shift in the third and final act. The story is still dedicated to its preexisting themes, but the abundance of ultraviolence is undeniable. It does look impressive and serves as a solid climax, but some of it only appears to exist for cool purposes. How many exploding heads are enough? Part of the charm and effectiveness of D9 is in large part to the people who appear in it. Sharlto Copley isn’t a recognizable star, maybe even a “mild” star at that. But that unfamiliarity works wonders, and adds another element of realism as he is featured heavily in the confessional moments of the documentary. His metamorphosis, both physically and mentally, is something to behold, especially when you consider that Wikus is a hard guy to sympathize with. He is very unlikable, and yet Blomkamp and Copley do just enough to make the viewer care about his reclamation. Despite being digital, the sadness, fear, and emotion of the aliens is on full display, and it becomes very easy to side with the group’s struggles and hardships. 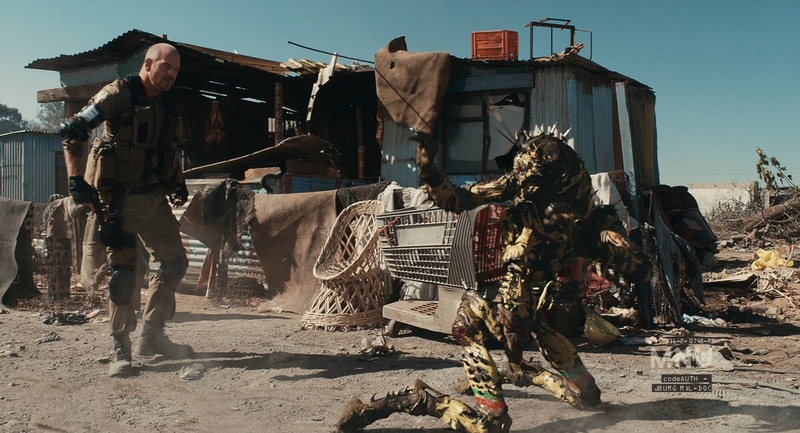 There may be a lot of secrets in District 9, but being a first-rate film isn’t one of them. Featuring a brilliant plot, proficient directing, and visceral action, it still stands as one of the better science fictions in recent memory. Photo credits go to impawards.com, marucarrion.com, dvdactive.com, and screenrant.com. Good review Jackson. It’s a fun thriller, but there’s also plenty of humanity to be found underneath, too. That made it all the better of a watch. A tremendous piece of sci-fi. Thanks for the comment Dan. Yeah there are definitely a lot of surprisingly difficult scenes to watch in District 9. We haven’t really experienced the same kind of visceral terror in his recent efforts, but I’ve liked everything he’s put out so far. Here’s to hoping ‘Chappie’ will continue the trend. Thanks Tom. I’ve enjoyed everything Blomkamp has put out to this point, though his main features do seem to follow a similar template. Elysium was one of my favorite summer movies of 2013 though, even if it flawed. Gotta give it a rewatch before Chappie. Hi Jackson. Great review. I love this one. I didn’t enjoy Blompkamp’s second feature, Elysium, quite as much though – but I’m still looking forward to Chappie later this year! Same. I did enjoy Elysium a ton and maybe more than the consensus, but if compared to D9 (hate to do that but it is hard not to) it ain’t close.